This sticker depicts both a male and female doctor on the left. On the right is the symbol for the Communist Party of Spain. This sticker was released by the Communist Party branch in Asturias, a region in the North-East of Spain. 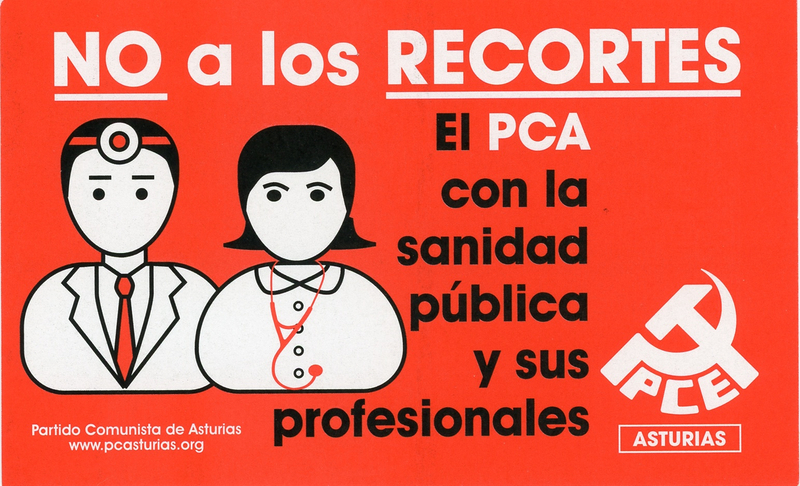 It's anti public health cuts stance is in responce to the actions of the Spanish government such as the Royal Decree Law introduced on April 20th, 2012. This law led to an overall restriction to Health Care by implementing many cuts such as an increase in the percentage of medicines paid by the user and a decrease in access to the health system by unregistered foreigners.